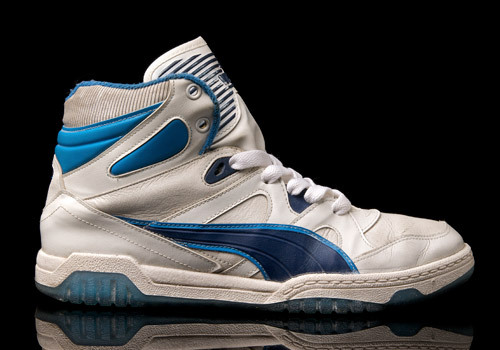 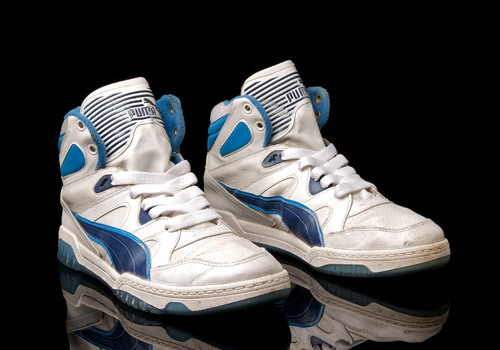 Even though I’m a sucker for purple hues splashed against all white vintage basketball silhouettes I must admit that I find the two tone blue colorway of these PUMA Avenue Hi’s to out match their sister shoe (done up in white, purple, and red). 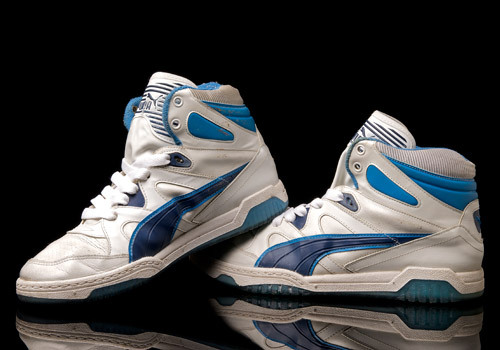 It’s not so much the color itself, but more the design decision to throw the whole thing atop a translucent, ice blue outsole, significantly adding to the shoe’s serious summertime flare, and further helping the wearer to remember that it’s a lightweight pair they’re about to put on; something that should be treated carefully, as though they were crossing over a frozen river. 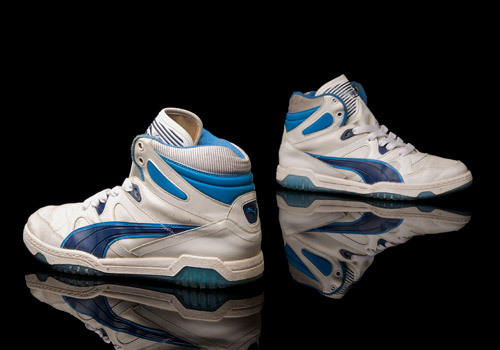 The Avenue model is made with an incredibly thin upper, that looks good, though certainly doesn’t provide any support on the court. 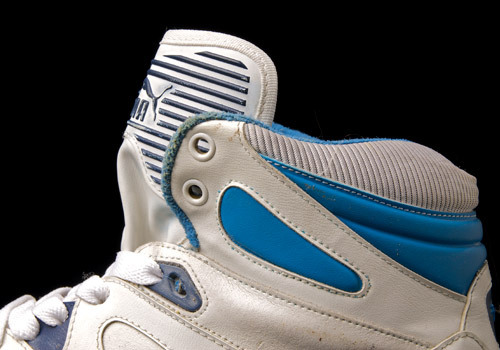 Despite their delicacy, it’s obvious that these have stood the test of time – even well worn as they are – and remain, for the most part, intact. 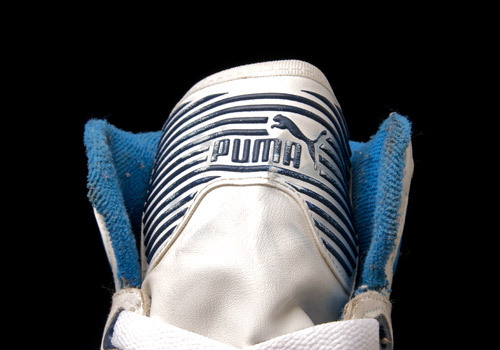 The backs of the tongues are sticky and flakey, though this was also the case on a brand new pair (not pictured here) which were properly stored in their box for twenty some odd years, leading us to believe that the cause is plausibly some sort of semi-natural chemical reaction due to the aging of the materials, and can’t necessarily be chopped up to shoddy workmanship. 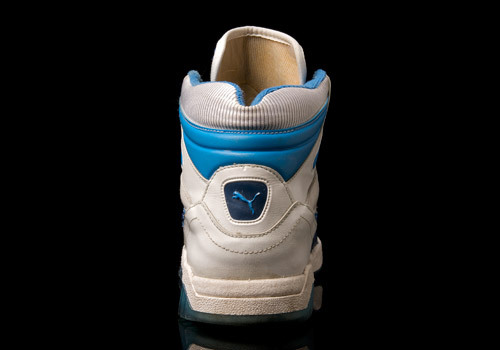 On the contrary, these PUMA Avenues were constructed in Italy, which might explain the thin, sleek, lightweight architecture behind the shoe. 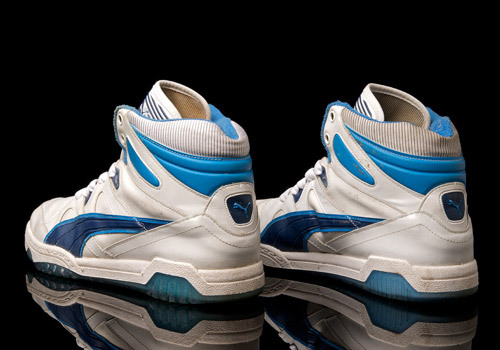 While they’re admittedly not a perfect pair, these PUMA Avenue Hi’s could certainly be another mark for your hit list if you’re into vintage basketball kicks and you’ve got a thing for pursuing the lighter weight models.